Want to buy a new phone this Christmas? Why not try a Smart postpaid plan. If you’re looking for the latest phones and gadgets you should take a look at Smart available devices. Recently they announced the price of LG G Pad 8.3 and now they’re up again with something new for their subscribers this holidays. Can you guess what it is? If not then continue reading below for other details. Nexus 5 is one of latest gadget offered by Smart running on the latest Android 4.4 KitKat Google OS. A quad core processor with 2GB RAM and 16GB internal storage powers this device. Added to that are cool features like 8 megapixels camera, 4G/LTE capability and True HD IPS screen display. 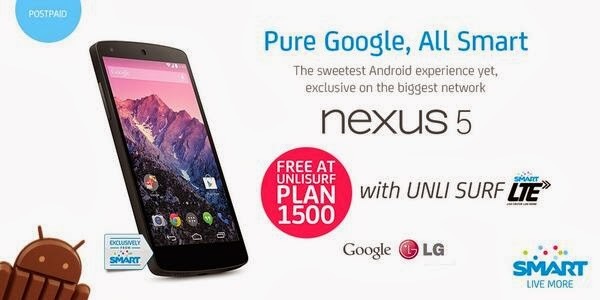 If you are planning to upgrade you’re current plan or avail a new one, LG Nexus 5 is a good options you can choose to. For only 1500 pesos you can now taste and experience how sweet KitKat OS. Smart give you unlimited LTE surfing for that amount plus call and text services. If you’re asking if LTE of Smart is really unlimited, the answer is yes as they extend it up to end of this year. We’ll just watch out for updates hopefully they will extended it again in year 2014. For now, let’s see other plan pricing of Smart Nexus 5. This device is also available on Plan 999 with 600 monthly cash out or 14,400 one-time cash out. For All-In Plan you can have this free at Plan 2500 and Plan 1800 with 30 months contract also. To those who want to opt out monthly bills you can get this phone via Smart prepaid for only 22,500 pesos.